When Kristin Eikaas arrives in America, she encounters prejudice and destructive superstition that is infecting the town. Will she have the courage to stand up for what is right—even against her own family? The year is 1848, and Kristin Eikaas has sailed from Norway to make a new life for herself in Wisconsin. It doesn’t take long for her Uncle Lars to warn her about the Sundberg family. 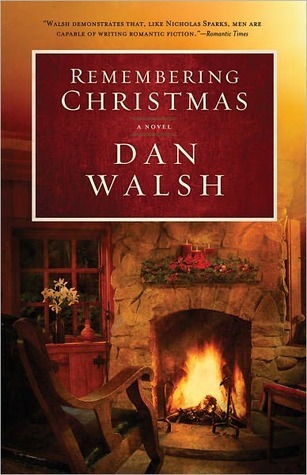 When she asks why, Lars tells her that Karl Sundberg’s second wife is an Indian who “casts evil spells on the good people of this community.” Having just left the old country where superstitions abound, Kristin believes her uncle and heeds his warning.On the day after her arrival, the family attends the wedding of a fellow church member. At the reception that follows, Kristin meets Sam Sundberg and thinks he’s charming. Still, she can’t help but remember her uncle’s warning. After coming to the rescue of Sam’s half-sister, Kristen is ostracized by her family and the entire community and sent to work at the only place that will take her in—the Sundberg farm. When she learns of Sam’s true nature, his benevolence toward others, his care and concern, she’s finally able to lay her belief in superstitions to rest and put her entire trust in the Lord. Furthermore, she can’t help but fall in love with Sam, the man who helped her understand this truth. She knows her uncle will never approve of the match. Will she have the courage to follow her heart? After the death of her family, Kristin Eikaas leaves Norway and arrives in Wisconsin at her uncle's farm. 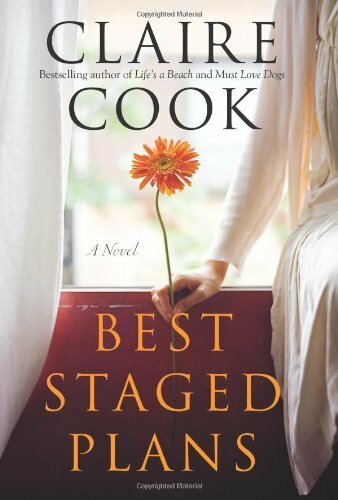 Anxious for a new start, Kristin quickly discovers that her uncle was less than honest about his situation and she finds herself in a difficult, abusive home. Her uncle has a deep dislike for the Sundberg family because Sam Sundberg's stepmother is Indian. Sam's father doesn't like the Sundberg's because he believes they stole silver from him years before. Yet, Kristin and Sam find themselves drawn to each other and when she helps his young sister, her family kicks her out. Sam's family brings her into their home as household help and Kristin finds herself falling in love. As the feud between the Sundberg's and the Eikaas' grows, the town and church congregation find themselves divided. Discovering how, and if, that divisiveness can be healed makes Threads of Hope a compelling novel. Some of the dialogue was a bit stilted and formal at times, but this was a sweet story about love and forgiveness. Andrea Boeshaar has a gift for creating realistic characters and situations. I've enjoyed everything I've read from her so far and as this is the first book in the Fabric of Time series, I eagerly look forward to more. Thanks to Jon of Charisma House and First Wildcard for the opportunity to review this book. 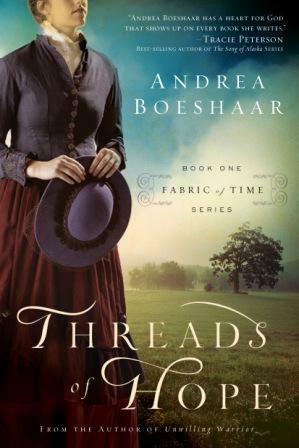 You can learn more about Andrea Boeshaar here. You can read the first chapter here. You can purchase your own copy here . When circumstances—and perhaps a bit of matchmaking—put Abigail and Ethan together, there's certainly attraction. But Abigail is planning to marry another man and return to life in Vermont as soon as she is finished attending to her sister. And Ethan loves his life in the Army and the wilds of Wyoming. When summer ends, will Abigail go back East? Or will she fall in love with this rugged land herself? 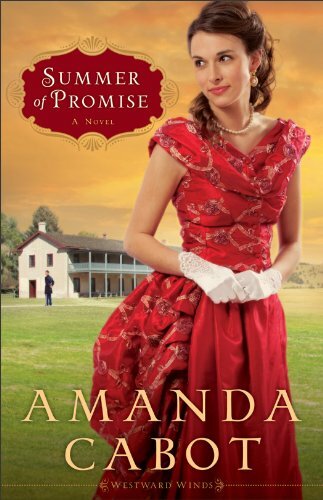 I love stories about strong women and Summer of Promise delivers a charming one. Abigail plans on marrying a fellow teacher, but before her wedding, she travels to Wyoming to spend the summer with her sister Charlotte who is married and expecting her first child. The journey out west is an adventure itself with a robbery attack on her coach. A young soldier traveling on the same coach saves the day and once at Fort Laramie, Abigail finds herself often in the company of Ethan Bowles. 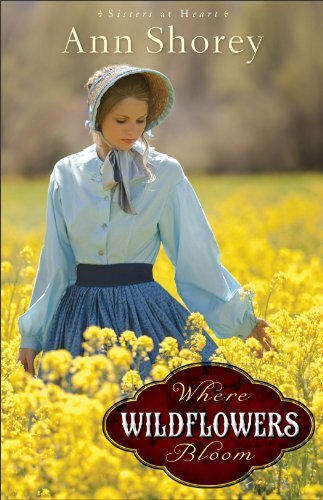 She doesn't love the army life nor the rugged Wyoming countryside, but as she is drawn to Ethan, she wonders if she can ever go back to Vermont. Abigail must find out why her sister's life isn't as charmed as she once thought and as stagecoaches continue to be robbed and equipment goes missing from the fort, Ethan must not only discover who at the fort is the traitor, but what Abigail Harding will do with his heart. This is a delightful, compelling story with a strong heroine and an element of intrigue and one I thoroughly enjoyed. I haven't read Amanda Cabot before, but I'm so glad to know that this is the first in a series. I look forward to more. 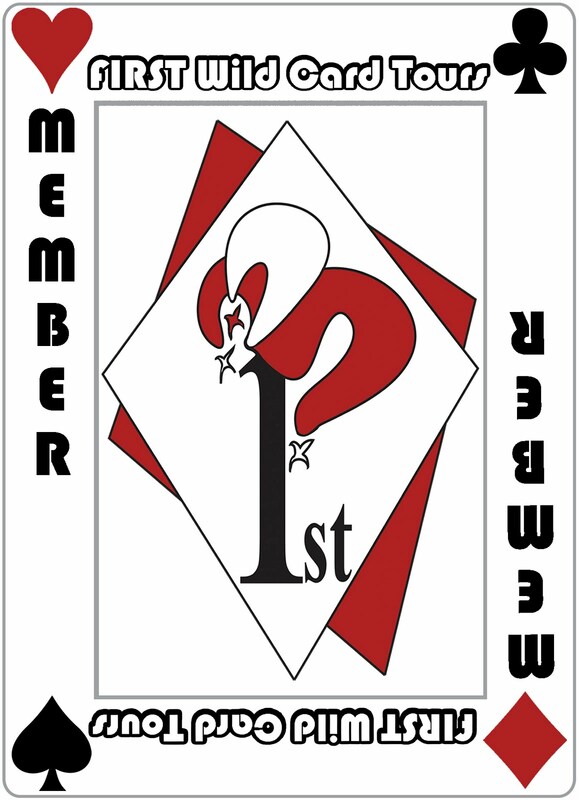 Available January 2012 at your favorite bookseller from Revell, a division of Baker Publishing Group. Thanks to Donna Hausler of the Baker Publishing Group for the opportunity to review this book. You can learn more about Amanda Cabot here. You can purchase your own copy here. 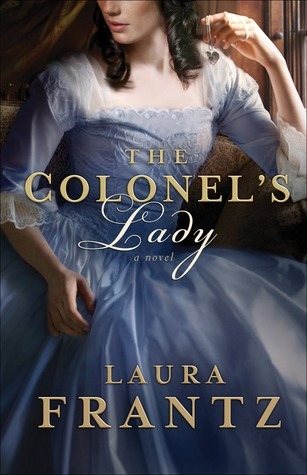 The War Between the States stole a father and brother from Faith Lindberg-- as well as Royal Baxter, the man she wanted to marry. With only her grandfather left, she dreams of leaving Noble Springs, Missouri, and traveling west to the Oregon Territory to start a new life, away from the memories that haunt her. But first she must convince her grandfather to sell the family's mercantile and leave a town their family has called home for generations. After Faith Lindberg loses her father and brother in the Civil War, she wants to leave Missouri for a new start in Oregon. Her grandfather wants nothing to do with leaving and wants Faith to run his mercantile so he can write his memoirs and stay in his home. As Faith begins managing the store, she secretly makes preparations to go west. But, life and God have other plans for her. I enjoyed these characters although I though Faith was somewhat clueless and selfish at times. Curt and Rosemary were terrific as was Amy. This was simply a sweet novel about love, family and friendship. I look forward to the rest of the series. 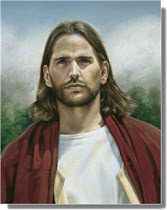 Available January 2012 at your favorite bookseller from Revell, a division of Baker Publishing Group. Thanks to Donna Hausler from Baker Publishing for the opportunity to review this book. You can learn more about Ann Shorey here. You can purchase your own copy here . Caught in a deadly conflict between American and Russian undercover agents, this innocent young pianist is just trying to survive her own personal trauma. Through it all, Liesl must learn that no matter how dark her world grows or how fiercely her enemies pursue her, God is still in control--if only she can yield herself to His grace. As a child of the 60's and 70's and a teenager in the early 80s, I grew up very much aware of the Cold War. Russia was the enemy and spies were real. As a young adult, I began working for a government laboratory in the late 80s, where we had security clearances, badges and guard gates. One poster that I remember being on the wall of our copy room showed the earth with a satellite orbiting it and two red lines. One went from Russia to the satellite and from the satellite to our location and cautioned that anyone could be listening. I took Russian classes as a young college student because I'd grown up fascinated by that country and I was studying that language as the Berlin Wall fell and Cold War communism became a memory, or so we've all believed. 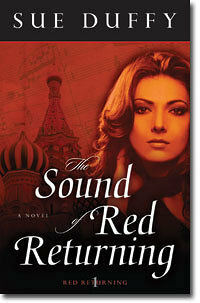 The Sound of Red Returning takes us into today's world of the CIA and KGB where national secrets are still desired, spies still lurk in our midst and the art of guarding and discovering intelligence is an integral part of national security. When Liesl Bower's beloved mentor was murdered and revealed to be a Russian spy, her life was disrupted in ways she couldn't imagine as the CIA didn't believe that she wasn't an accomplice. But life does go on and Liesl became a renowned pianist, putting her past behind her. 15 years later, information comes to light that leads Russian and American intelligence agencies to her door and Liesl must discover what information she has, where it is and who she can trust. I enjoyed this novel so much. These characters are likeable and you care for them immediately. The intrigue and suspense are fast paced, but perfect and not predictable. I loved the musical aspect and the cleverness of sending codes through sheet music. Amazing. I am thrilled that this is the first in a trilogy and I look forward to more from Sue Duffy. Thanks to Amy at Litfuse Publicity for the opportunity to review this book. You can learn more about Sue Duffy here. You can purchase your own copy here . You can read an excerpt here. You can see other reviews and tour stops here. Whether empty nesters who are downsizing, newlyweds who are setting up their first nest, or anyone who needs creative new ideas, readers will love these strategies, tips, and solutions to maximize their space and enhance their quality of life. This is a terrific go to guide for downsizing and organizing. We really do have too much stuff these days and many of us don't have huge houses in which to keep it all. Kathryn Bechen approaches organization from the aspect of not having a lot of space to begin with. She takes you through each room in your house and gives suggestions for eliminating, storing and maximizing. 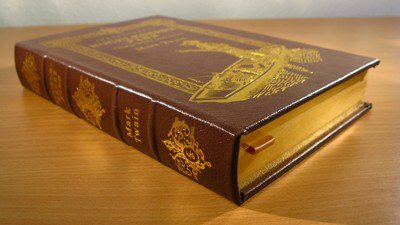 This is a book you can read straight through as well as being a book you can pick up simply for help with one particular room or issue. 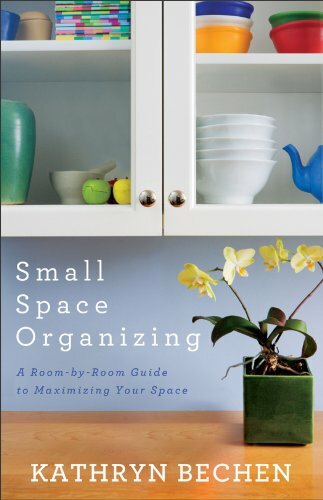 My only complaint is that the book is written for small spaces, but not necessarily small budgets. There are lots of suggestions for buying this or that to update or improve a space and that's not always realistic for people. 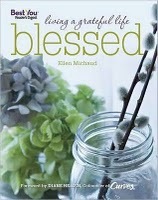 Available January 2012 at your favorite bookseller from Revell, a division of Baker Publishing Group. Thanks to Donna Hausler of Baker Publishing for the opportunity to review this book. You can learn more about Kathryn Bechen here. You can purchase your own copy here . It's 5:00 PM. Everyone's hungry. It's takeout or fakeout, meaning nuking a processed meal from the freezer. But there's a third option that doesn't include processed food or an unhealthy heap of calories and fat--Robin Takes 5. Imagine quickly preparing delicious meals for yourself, your friends, and your family with just 5 fabulous ingredients. Does it get any better? 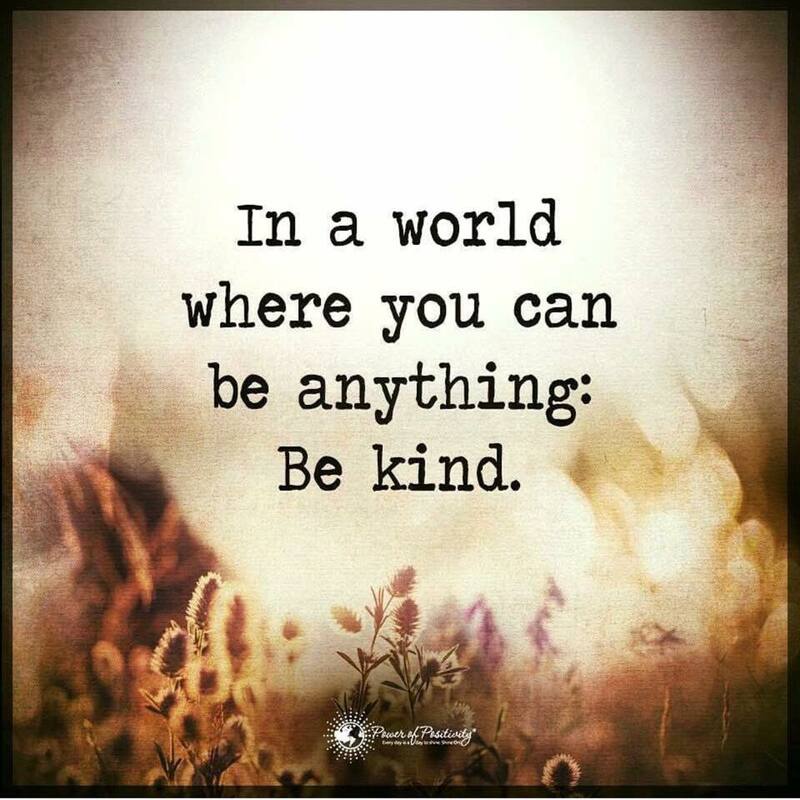 Absolutely, with Robin Takes 5. The book features 500 recipes and each dish is a mouthwatering 500 calories or less. Two-color recipe text complements full-color photography inserts. In addition, helpful icons note ideal recipes for holidays and entertaining as well as recipes with less than 500 mg of sodium. 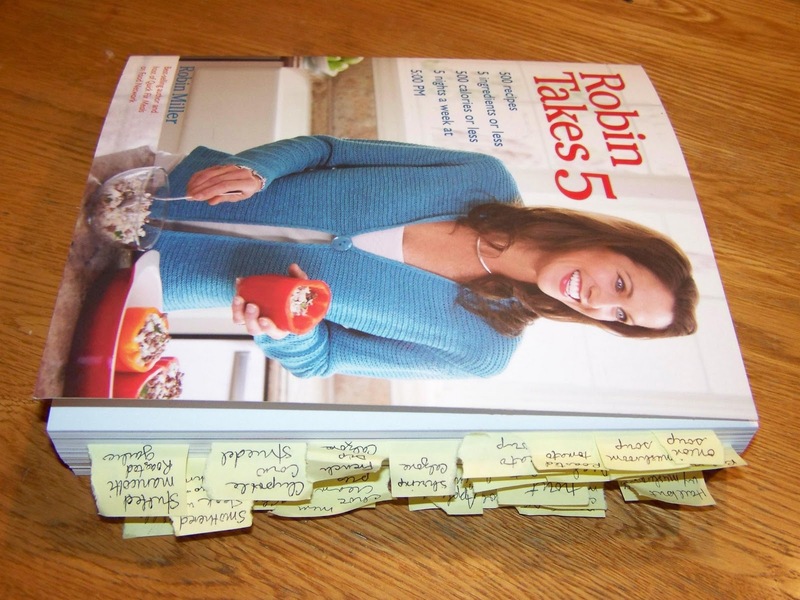 That's not all--nutritional information is given for each recipe. 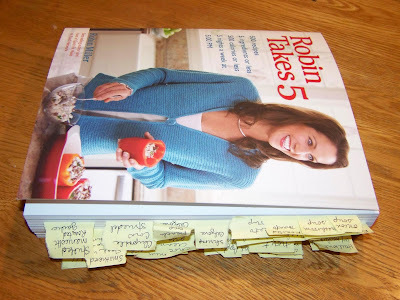 In Robin Takes 5, 500 recipes highlight at least 10 different ethnic cuisines, and dishes range from soups, pizzas, and pastas, to chicken, beef, pork, seafood, side dishes, and desserts. Consider 70 recipes just for chicken, such as Cashew Crusted Chicken with Roasted Jalapeno-Mango Chutney, and 50 dessert recipes, such as Orange Marmalade Tart with Chocolate Covered Almonds. Consider yourself armed for mealtime. 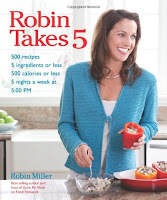 The next time the clock strikes 5:00 PM and you want both noshing and nourishment, check out Robin Takes 5. I was not familiar with Robin Miller before I received her book. But, I love cooking and as we're trying to eat healthier at our house, this sounded terrific. 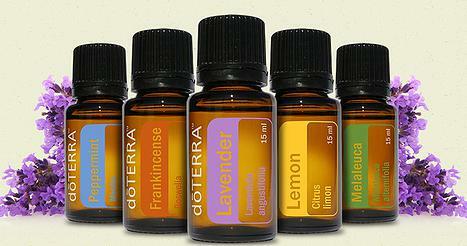 Every recipe has just about 5 ingredients and is less than 500 calories. I've marked it up. Seriously, it's full of post-it tabs. I do wish there were more photos, but it's easy to read and the recipes are easy to follow. Most recipes are fairly fast to make and not time intensive and the ingredients are ones you are likely to have on hand. I prepared the Pork Chops with Sauteed Apples for dinner and my family loved it. It received rave reviews and has earned a place in our dinner rotation. The leftovers are perfect on top of a salad. Next on my list is Smothered Steak with Onions, Mushrooms and Mashed Potatoes. Thanks to Eric at Planned Television Arts for the opportunity to review this book. You can learn more about Robin Miller here. You can purchase your own copy here. 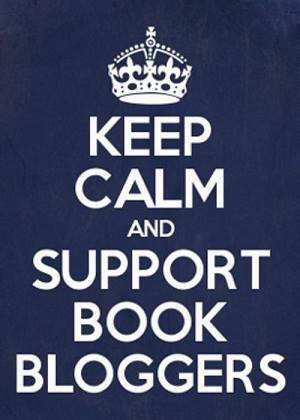 As I've cruised through the book blog world, I've noticed a few things. 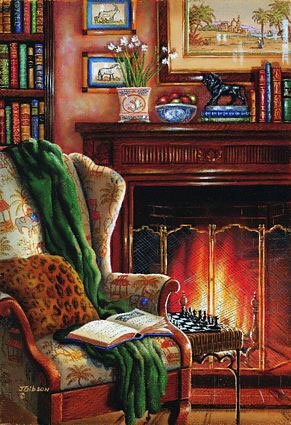 First, lots of year end wrap ups and postings of favorite books read. I love those posts and did one myself. I've enjoyed perusing so many favorite books and I've added quite a few to my reading list. The second thing I've noticed is several posts from bloggers who are re-evaluating their blogs, reviewing, etc. I've been doing the same thing myself. 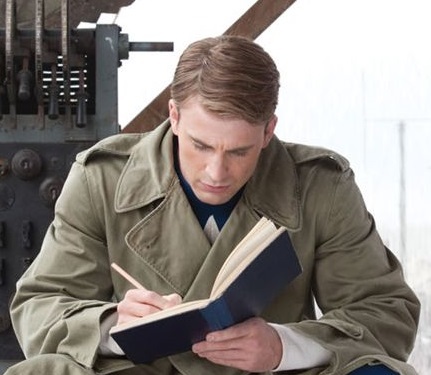 I love reading. 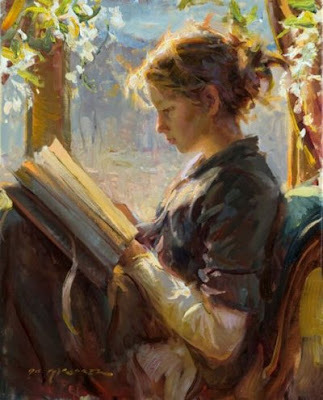 I was always the kid who had her nose buried in a book and I became an adult who always has her nose buried in a book. I love reading and it's why I started this blog. I wanted a place to keep track of the books I read and what I thought about them. The reviewing part just sort of happened and, for the most part, I've enjoyed it. I love receiving complementary books in the mail. I have enjoyed "meeting" authors and bloggers. I get a kick out of seeing a new comment on my blog. One thing I've finally admitted to myself, though, is that I don't enjoy reading for deadlines. I understand the reasoning behind scheduled book tours and I know that publishers/authors want the books they send out to be reviewed. 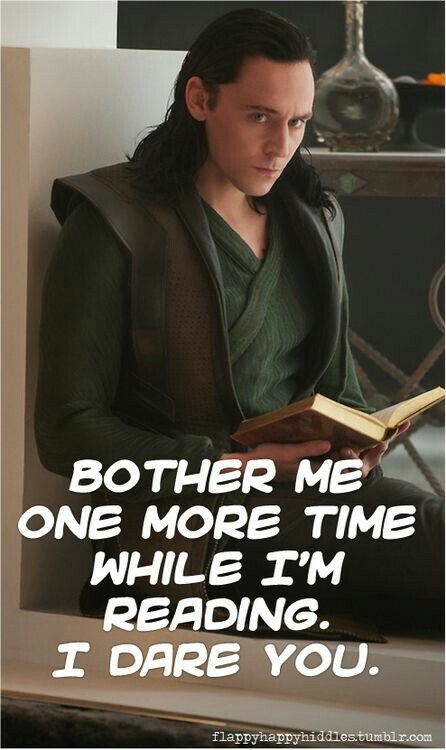 However, I've learned that sometimes you have to be in a certain mood for a certain book. There have been DNFs and one and two star books that I think I might have liked, if I could have read them within my own time frame and not someone else's. Towards the end of 2011, I didn't want to visit book blogs, I didn't even want to read because of the pressure to finish certain books. 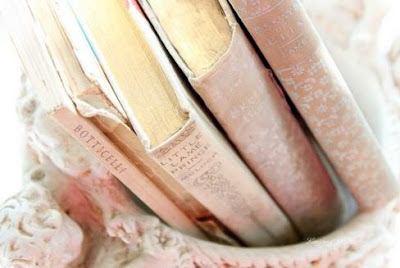 And, let me tell you, not wanting to read is a very disconcerting, strange feeling. 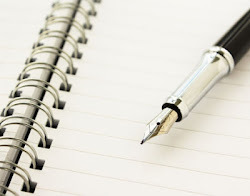 So, I've decided to be more discerning about the books I accept for review and that means less self published books and fewer scheduled blog tours. I won't give up on blog tours altogether though as there are authors whose books I will always, gladly review. 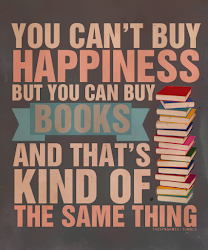 But I also want to read more of the unread books lingering on my shelves. As well, instead of always accepting review books I'd like, I will utilize my library to find those books on my own time, not for someone else's deadline. What about you? Is everything in your blogging life staying status quo or are you changing things up? Julia Lapp has planned on marrying Paul Fisher since she was a girl. Now twenty-one, she looks forward to their wedding with giddy anticipation. When Paul tells her he wants to postpone the wedding--again--she knows who is to blame. Perpetual bachelor and spreader of cold feet, Roman Troyer, the Bee Man. Roamin' Roman travels through the Amish communities of Ohio and Pennsylvania with his hives full of bees, renting them out to farmers in need of pollinators. He relishes his nomadic life, which keeps him from thinking about all he has lost. He especially enjoys bringing his bees to Stoney Ridge each year. But with Julia on a mission to punish him for inspiring Paul's cold feet, the Lapp farm is looking decidedly less pleasant. When Paul Fisher postpones their wedding, yet again, Julia Lapp is understandably frustrated. When she realizes that he did so after talking with Roman Troyer, she's incensed. With her father in ill health, she has her hands full and dealing with Roman Troyer is not something she looks forward to. However, as often happens in life, God has other plans for both of them. 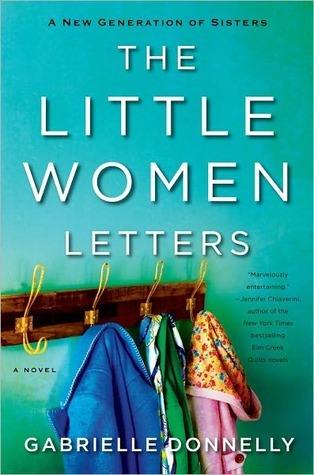 Another delightful novel from Suzanne Woods Fisher. I loved these characters. I enjoyed Fern and seeing her take over the family and become a welcome addition, even with her prickly nature. The Lapp family is terrific and the Lapp daughters are strong and spunky. I can't wait to find out what happens to M.K. and Sadie and I'm thrilled that this is the first of a series. I appreciated the topic of organ transplant and the strong case made in support of organ donation, even as I was sad over the loss of a beloved character. 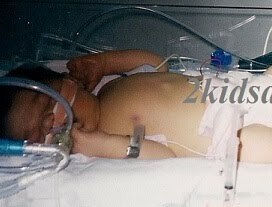 I wish more people understood the importance of organ donation. As near as I can tell, I read and reviewed 160 books in 2011. Of those, 5 were DNF. I wanted to beat my 2010 record of 163 and if you count the books I re-read, I definitely went over that number. But, 160 new books this year is still just over 3 books per week, so I guess it is an accomplishment. I've gotten a little burnt out on scheduled book tours and reading for deadlines, so it will be interesting in 2012 to see what the number is. Thanks for stopping by this past year. Thanks for your comments and suggestions. 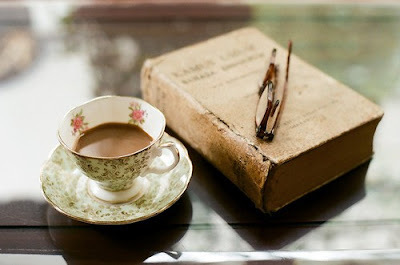 Here's to a fantastic 2012 and many more good book discoveries!